When I have some time to knit something for myself, I'm going to try a Contiguous Method sweater, like Sleeven. Top-down knitting has never really clicked for me, but I think I'd like this method, since I like the tailored look of set-in sleeves but don't like seaming. I know lots of people love knitting pieces and seaming and all that, and there are definitely advantages (you can work on one piece at a time without having to carry around a whole sweater, seams can add stability, etc. ), but I love the physical flexibility of seamless sweaters. And even though I've advanced my seaming technique, I'd rather not when I don't have to. So check out Sleeven or one of Ankestrick's other lovely patterns that use the Contiguous Method. 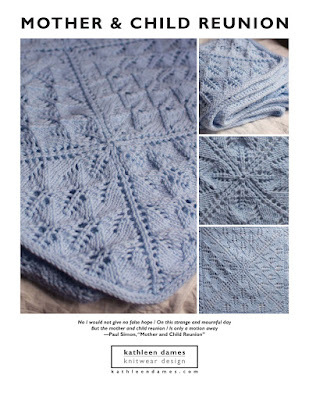 Sleeven pattern is $6.07 (4.50 EUR). 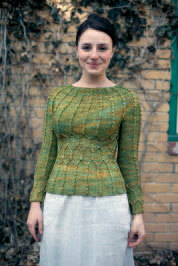 You can now purchase Sotherton as an individual download from the Interweave store! The individual pattern is $6, or you can purchase the entire issue of Jane Austen Knits, Summer 2012 for $8.99 (on sale - normally $14.99). I'll let you know when An Aran for Anne will be released as soon as I know. Apologies for not doing any Falala posts this week - I've been working at Penelope's school a few days a week while one of the teachers is out, so my limited "focus" time has been even more limited. I'll try to catch up this weekend. *I'll get a picture of the three of us this weekend for you - one of the little joys of having girls. The fourth holiday pattern is beyond cute and comes from Susan B. Anderson, a great knitted toy designer. This little sheep (make a black one for that special person in your life) makes a great ornament or gift for the knitter or shepherd in your life. Wee Sheep pattern is $4.50. There may be time (if you're a quick knitter) to whip up a lovely pullover for the special man (or woman) in your life. Mari Muinonen/tikru designed Armas, which means "beloved" in Finnish, for a bulky weight yarn. When I was visiting my parents for Thanksgiving, I enjoyed using a blankie I knit up in Cascade's Eco Wool, so I highly recommend it as a yarn choice for this pullover. Armas is also part of Mari's pattern book Hold Your Needles, so you could knit something for just about everyone on your list. Sometimes I try to resist the twee, but most of the time I embrace all its darling weensieness (that word is so misspelled, and you're just going to have to live with that). Falala #2 is the Wee Tiny Elf Sock courtesy of Meg Bakewell, and I love it! Curled up toe, bell, and all. Plus, it's a good way to use up all those sock yarn nuggets you have leftover. Make up a bunch for trimming the tree, as gift card holders, or an ersatz Advent calendar. Bonus: this one is free. And involves bells. Extra bonus: Meg sells adorable sock blockers in her Etsy shop. I have a little catch up to do, here, so you will find three Falala posts today! In previous years I've had a theme (free, independent designers), but this year I'm just going with whatever strikes my fancy, so some patterns will be gift ideas and some will be to queue for a reward to yourself after the gift knitting is complete. First up: My Deer - a deer trophy - an adorable, clever, free pattern for a knitted and fulled deer head trophy from the talented Claire Garland. This is perfect for the vegan OR hunter on your list, or anyone in between! I knit mine up in one day with some Malabrigo Merino Worsted in Taupe from the good people at Three Bags Full, and then threw it in with the towels in the wash (I tried it with the "warm" wash, but it really needed "hot" to full). I think I will make a second and stuff the antlers before fulling, which wasn't specified originally. The antlers look good but are not as robust as Claire's original. I think I have enough Taupe for the head and ears and will do the antlers in some Natura I have left over from Isobel's set of Matryoshka dolls. I have a new shawlette pattern to share with you: Castaway. Worked from a tab start at the neck down to a ruffled edge, this is perfect for that skein of Malabrigo Lace that you couldn't resist. The stickiness of the yarn works to your advantage to keep the ladders from pulling at their neighbor stitches. If you can cast on, bind off, knit, purl, and work basic increases and decreases, you can create this lovely, soft shawlette. This is a "wide" triangle shawl, which means you increase at four points on the front and two on the back. A friend of mine, who also is an LYSO, thought this was cashmere when I showed it to her. One skein of yarn, one circular needle, and one pattern are all you need to make your own Castaway - perfect for desert island knitting (or when you want to get away from it all!). Pattern available for $6 on Craftsy, Etsy, and Ravelry or by using the button below. © 2009-2015 Kathleen Dames. Simple theme. Powered by Blogger.